I feel your pain. I looked at mine today too. Beautiful lace.... who needs sleeves? I know, it's so hard! Sleeves are the worst (or maybe seaming them to the body of the sweater is the worst, I can't decide.) Right now I'm putting off the latter and casting on for the two new KALs that start today. Hah! Even if you don't finish them now, by the time you get to that edging you will be DYING to knit those sleeveless sweaters... That edging looks fiendish. 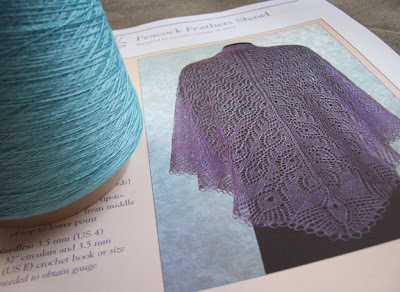 Hmm, based on that pretty lace weight, I'm thinking sleeves will have to wait. Naw..... Sweaters will be too hot. Make the shawl. Summer is coming...I want to see that turquoise knit up. And think, when you need a lace break, the sleeves will be there to pacify you with mindless knitting. OMGoodness, that is GORGEOUS! And, don't get me wrong, I am one of the few, the mighty, the monogamous knitters, so I'm not suggesting casting on....yet, LOL! Life is short, spring is here, go for the lace! the sleeves may make good mindless, knitting-on-the-go project. (I made a whole sleeve while waiting for my teenagers during an outing to Great America last summer). LOL, I'm dealing with this same issue! Sally of The Rainey Sisters (I am the other sister) just finished her Peacock Shawl. She will post pictures today (4-6-07). It is the most beautiful thing I've ever seen. My yarn is winging its way to me right now, but not fast enough! I hope you get to yours soon :). From Susan -- you know you want to knit it.....it is CALLING you!! The shrill, piercing siren call of the Peacock. Give in to temptation. You know you won't regret it. I made the mistake of ending up at that ColourMart site. I blame you. I would have given in to a lot of temptation but I am very confused by their gauges/yarn weights. Ooooh I love Peacock Feathers! I think it is my favorite thing I've knit thus far.